One of the best things about quilting is being able to give quilts to people who will appreciate them. 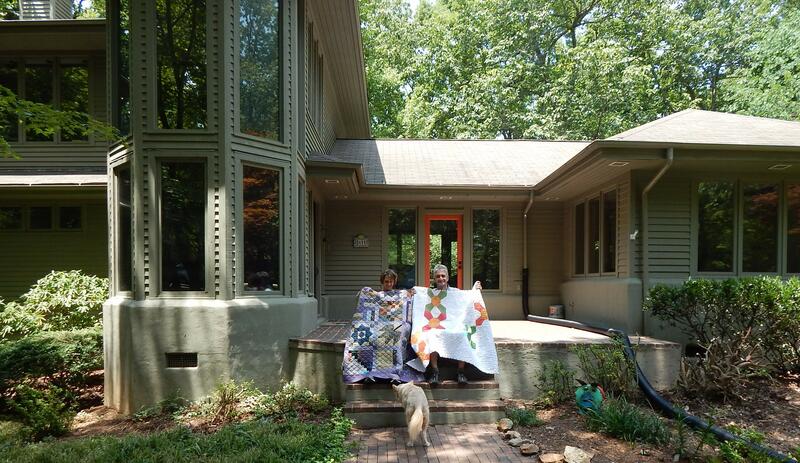 Our friends Jim and Michele recently moved and, when we went to see them and the new house, I took two big piles of quilts so that each of them could choose a quilt to use in their new home. Michele chose a quilt to cuddle under while watching TV or reading, and to my surprise it was a traditional sampler quilt made from a block swap with friends. The choice certainly reinforced my idea of letting friends choose their own quilts rather than choosing for them. Who knew that a photo in bright sun would show up the quilting so well? Jim chose one to hang in his music studio. Michele recently sent a picture of the quilt hanging there. As you can see, it goes well with his other bright decor. This is a variation on a design I did for Modern Quilts Unlimited several years ago. 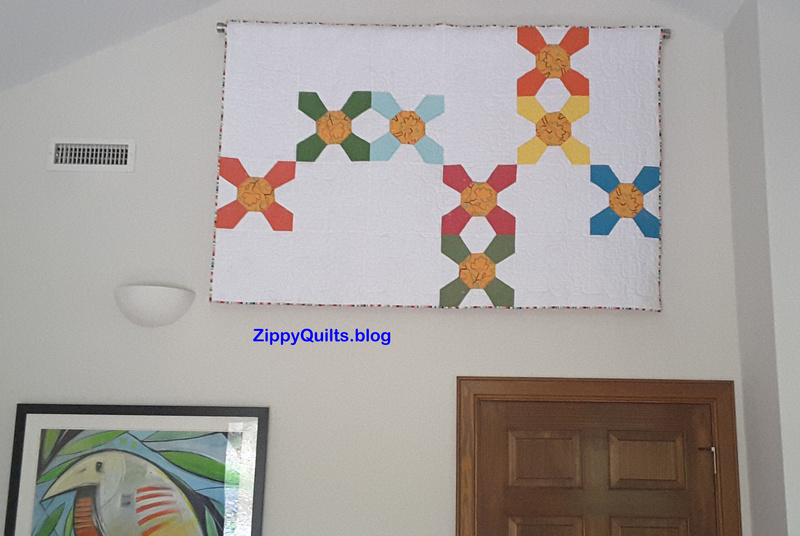 This entry was posted in Modern Quilts, Quilting and tagged modern quilt, Quilt by zippyquilts. Bookmark the permalink. Lucky friends. I like giving quilts. Your idea of letting people choose is a good one. This is my last day of visiting with my granddaughter. She and I have been designing her next quilt. I love children’s art. We have been looking at some of her art work and just playing with designing around the pieces. Well, I usually have them quilted by others, which speeds things up! Have thought about you several times as we have passed quilting shops here in the Nortwest! 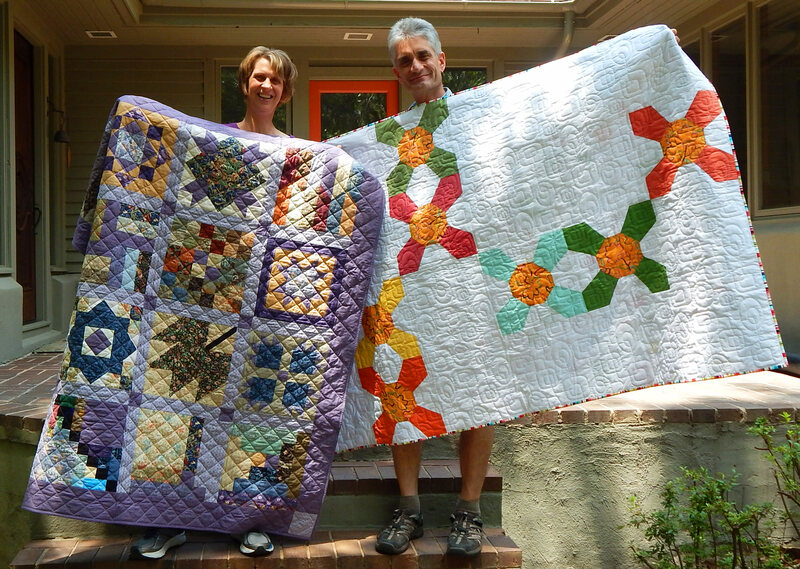 How cool of you to let friends choose their quilt-gifts…from a stack of ’em already made and waiting for adoption. Wow! I personally love them both…the purple cuz it’s purple dominated and scrappy, and the one you dub as more contemporary because the quilting (that is highlighted in the sunshine shadows of the photo) is what really makes it pop, IMHO. Lucky friends, lovely quilts. I also like the sampler one. I really like the idea of sharing a quilt but letting them choose! Beautiful quilts! Thanks for sharing.